Professor Diana Gisolfi just returned from the March 15 colloquium at the National Gallery London in which scholars discussed the exhibit on Veronese. She has been consulting on and is writing for the linked, but not identical, Verona show on Veronese that opens in July. The London exhibition, called “Veronese: Magnificence in Renaissance Venice“, runs 19 March – 15 June. In the Colloquium on Saturday March 15 some 40 invited scholars and curators viewed and discussed the almost 50 paintings in the show room by room. A lunch and a teatime allowed for small group chats. 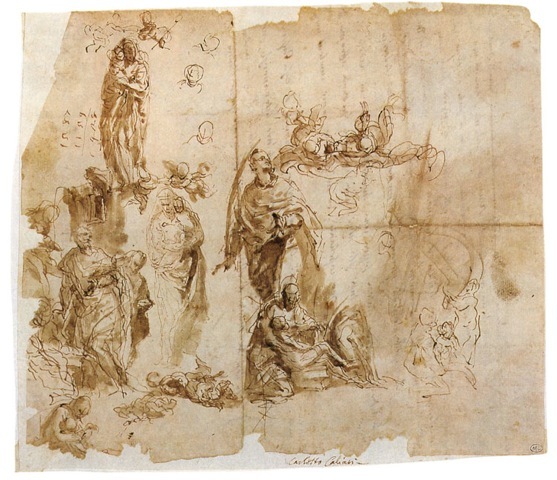 The show features paintings in oil only, from Veronese’s earliest oil sketches of 1546 (which Professor Gisolfi Identified in her Art Bulletin article of 1982) to his last altarpiece of 1587. The linked show in Verona, called “Paolo Veronese” will open to the public on 5 July and run until 5 October. Some of the same paintings will be shown, many stunning drawings will be included and also some works by Veronese’s heirs after his death when fully active at age 60 from “a fever”. Gisolfi is writing one of the essays for the Verona catalog and has served as a consultant on the show. She is collaborating on a virtual reconstruction to be displayed in Verona of a destroyed villa decoration by Veronese and his colleagues about which she has published twice.